The Train finally left Winnipeg's Union Station around 2:30 am. This leg would be our longest. Originally it was scheduled to be thirty-four hours long but, as we’ve found for all trains west of Toronto, the trains never run on time. 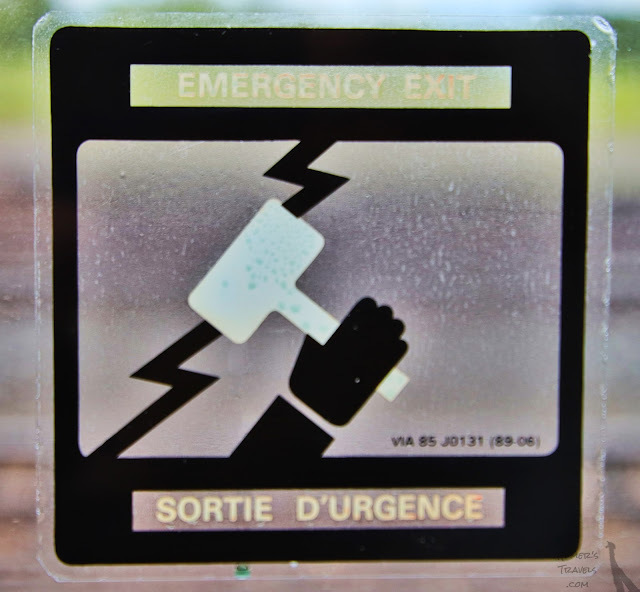 In case of emergency summon Mjolnir and access the power of Thor, the God of Thunder. Riding economy class means we are in peasant class. We do not have access to the dining car as that is reserved for the elite sleeper class. The peasants have access to a snack car with a small, but tasty, kitchen. The firefighters who got on the train before us sealed our food fate when they determined that the kitchen was unsafe. The peasants were allowed to use the dining car but, frankly, many of the people in economy are there because they can’t afford paying the dining car prices. So for them, and us mostly, we were condemned to eat unhealthy junk food and unappetizing cold sandwiches for the thirty-plus hours we were on the train. The thirty-four hours turned out to be thirty-eight as the trained lost four more hours before it arrive in Toronto. We couldn't have gotten off that train any faster. We'd had enough. We collected our bags and walked the block to our hotel. We'd planned to do a lot on our arrival but, since the train arrived nine hours late we were limited to finding a bar that served food near by (The Loose Moose), eating a good meal, and going back to the hotel to pass out in our bed.